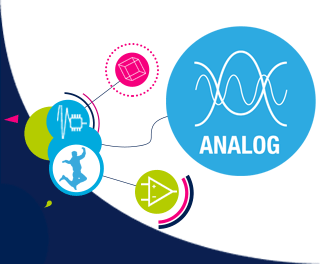 Any analog integrated circuit, whether standard or custom, consists primarily of a few basic circuits connected in such a way as to perform a desired analog function. These basic circuits are transistor amplifiers in various configurations, the current mirror, the voltage reference, and various types of output stages. Operational amplifiers (op-amps) and voltage regulators by far stand out as the standard circuits with the widest application in systems of various kinds. During this one-hour webinar, we will consider the basics of operation and application of these widely-used standard circuits, with the intent of providing a guide to understanding the parameters and key performance of each, and at the same time exploring STMicroelectronics portfolio and tools for this important class of analog circuits. Piercarlo Scimonelli is the Product Mark​eting Manager for the General Purpose and Custom Analog team at STMicroelectronics. He has almost 20 years experience working with power management and signal conditioning analog ICs. Piercarlo is based in Schaumburg, Illinois.